Tameka's Corner: BLOGMAS Day 01 - 10 Women-Owned, Minority Small Businesses to support during the holidays!! 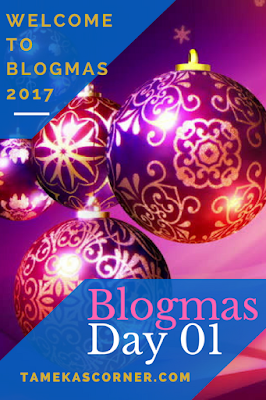 BLOGMAS Day 01 - 10 Women-Owned, Minority Small Businesses to support during the holidays!! I can't believe that the year is almost over!! It's like 2017 flew right by us. It's been a year full of ups and down, curves and loops, and thankfully growth and blessings!! This was my second full year in business for my newest business venture and it was a doozie. They say that it takes about 3 years to really get a brand new business off the ground, so I'm looking forward to next year being the charm and hitting m sweet spot in that venture. My other businesses are moving along well, but I must admit, I've neglected them a bit in order to give my full focus to my less established venture. But luckily, they can pretty much sustain themselves, for the time being. Speaking of business, I decided to make my first Blogmas post about some of my favorite Minority, women-owned businesses. They are listed in no particular order and all offer something very special to the world. They all have products and services that are the best in their industry and they all are provided with quality, excellence, and purpose! Check the links down below and you will surely understand why I love these businesses so much!! Trishnard Cards is a boutique that began as a card line but in the last few years they have added various products to their product line. They now offer a classy line of bow ties to fit the needs of every gentleman in your life, regardless of age and style. Everything is hand made and hand crafted offering you a unique and distinctive product that will put you on the cutting edge of current fashion trends. Best of all, the products at Trishnard are affordable and made with quality materials and excellent craftsmanship. This soap has been a blessing to my skin and those in my household for annoy 10 years. It's made with locally-sourced, raw goat's milk and "made by hand" by one of the best to ever do it. They have various recipes to choose from. My favorite is the lavender soapsicle. I also like the oatmeal bar shaped like a heart, and even better, it comes in many hears also!! Another great thing about this brand is that they have a monthly subscription box, as well as gift sets that encompass different items so that you can try them out find your favorites. The soaps are also great for adults and kids with excema!! As if the products in this line were not perfect enough, the back story on this brand warms the heart. When I first began purchasing Jolie Bloom products, it was a natural, hand made, eco-friendly beauty brand that was marketing towards women who needed self care. Three brand was started in honor of the founders daughter, Jolie. The products are amazing!! They smell great, moisturize to perfection, exfoliate to the heavens, and feel as smooth as butter!! There is also quite a bit of variety in the products so there's literally something for everyone!! Recently, Joile Bloom did a re-launch that created a community that caters to Moms who have experienced to baby loss, and focuses on the healing process. There's nothing like a powerful, experienced woman teaching you how to brand a growing business. Connecting the Dots can be difficult, right? There is often so much to think about and so much to do with a business, organization, ministry or just walking or living out your purpose and vision. Ashby & Watts consulting is committed to making the process of marketing, branding, strategy and management simple. With strategic listening and input, they help individuals, organizations, ministries and businesses find their voice and use their resources to thrive and grow. Lee Watts, has worked with a wide variety of clients in a ton of different business segments. For that reason, I am so blown away with her vast amount of experience and ability to help ANYONE with their clarity and marketing goals. Having dolls as a little girl is one of life's fondest memories. It's as ingrained in our culture as American Apple Pie. I was so tickled pink to meet Sugar, one of the newest educational dolls created by Daddy's Little Girls. Her cute curly hair and beautiful, impeccable skin will be joy and pride to the hearts of your favorite young girl! Each doll incorporates fun with learning, through their songs, language content and educational accessories. Dubbed as the "Best Sweet Potato Pies in the South," these desserts are everything that you dream Sweet Potato desserts to be. One thing that I have always admired about artwork in homes and work/event spaces that I frequent, are pieces that are personally commissioned by unique artist. The art by Tavia Stewart from NonVerbal Articulation, includes pieces that bring out that type of emotional response in its viewers. Her pieces are colorful, thought provoking, and masterfully created. I have loved all things Eeshes Peices for quite some time now. I try my hardest to stay away from these cupcakes but for the life of me, I just can't. Talk about making you weak!! These cupcakes are E.V.E.R.Y.T.H.I.N.G!! Last but not least, I must say that as the holidays near, I tend to indulge in a little holiday shopping from my own AVON business!! Avon has come a long way done i first became a rep. We now have an amazing housewares line, vitamins for skin and wellness, the newest, cutting edge fashions and shoes, along with our tried and true make up and skin care collections. Those all sound like pretty cool businesses. I am really curious to learn more about dope soap on a rope. It sounds like fun to me. Yeah, this is something really interesting:) would love to know more. Thanks for sharing!